Get ready to get kind, Chappaqua! Monday, October 23rd is a county-wide Act of Kindness Day! This means get out and do something nice for someone–hold open a door, pay for someone’s coffee, compliment someone, etc. You’ve probably noticed signs up and around town with kind phrases on them; those were put up by the director behind this whole event, Evy Rosen. These positive hormones don’t only affect the person doing the kind act, but receiving and seeing it as well. “It’s like when you’re watching a movie and somebody does something really nice or romantic – you feel happy just watching it,” Evy said. The day doesn’t need to end once midnight strikes. The goal of AOK Day is to cause a positive ripple effect, encouraging people to continue to be kind every day to change society’s negative perception. A recent AOK Day in Pittsburgh led to positive results, such as the community feeling closer than ever and overall good responses. 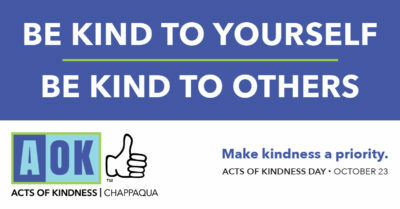 Evy’s goal is to not just spread kindness throughout Chappaqua, but to eventually have an AOK Day in Pleasantville, Mount Kisco, etc. “I am hoping to engage the entire community; schools, stores, places of worship, etc.” Evy added. Share your acts of kindness with the official Facebook page and coming soon Instagram account to be featured! 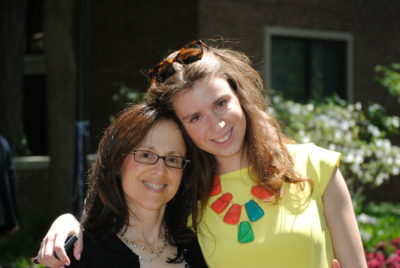 Molly Alexander, a senior in the LIFE School at Horace Greeley High School, is an intern for Inside Chappaqua and Inside Armonk Magazines.